vysyble uses and promotes the value-based metric of Economic Profit whereby all the costs of conducting business are considered including charges for capital, interest and taxation. Additionally, vysyble deploys its own proprietary methodology in calculating the relationship between Economic Profit and Revenue. The resulting value is known as the EP/R Value®. 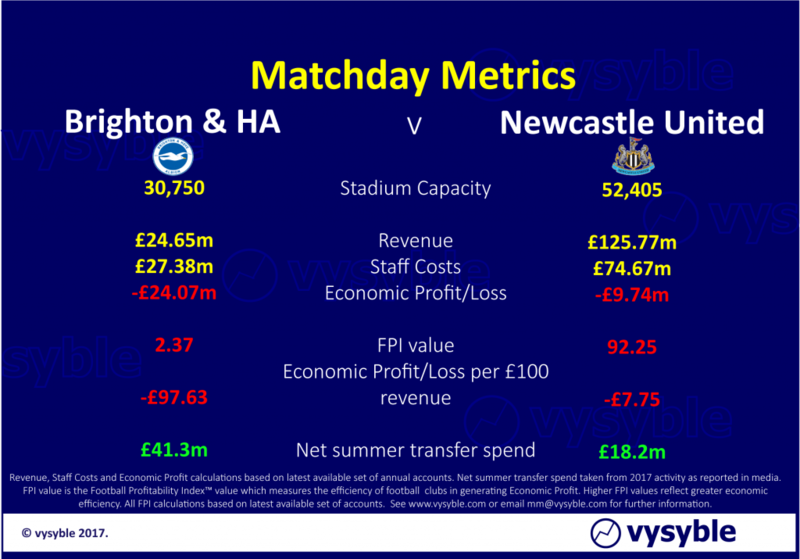 In turn, the EP/R Value is used to construct the Football Profitability Index (FPI) including individual club FPI Values and economic performance per £100 of revenue. ‘We have seen an upsurge in interest in our work since the publication of our economic analysis of the Premier League clubs. The reaction and feedback to the initial test releases of Matchday Metrics has been highly encouraging. It clearly gives us an opportunity to highlight club-level economic performance in a way that is both interesting and engaging for fans and will hopefully add to the overall experience of the pre-match build-up,’ said Roger Bell. Distribution of the Matchday Metrics information will be executed via social media including Twitter and other relevant media channels. vysyble was launched in August 2016 and has gained international recognition in the calculation and examination of companies and market sectors in generating Economic Profit and shareholder value. vysyble provides sector-level reports and individual company assessments on a paid-for basis. EP/R Value is a registered trademark.